Sarah, 12, an articulate, captivating narrator, survived an attempted murder by her mother 10 years earlier; her twin brother did not. Her father, an alcoholic, moves the two of them to a new town whenever their story becomes known. Afraid of following in the footsteps of either of her parents, Sarah struggles to define herself, drawing courage from a number of sources. She seeks out neighbors who can provide guidance, formulates a plan to meet her institutionalized mother, and writes letter to Atticus Finch, her idealized parent, as she explores and analyzes herself and those around her. Karen Harrington was born in Texas, where she still lives with her husband and children. 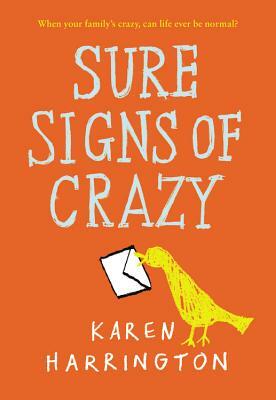 Sure Signs of Crazy is her first book for young readers. You can visit her online at www.karenharringtonbooks.com.